Artificial intelligence emerged as one of the hottest topics in tech in 2016, but not all AI companies saw their stocks rise in the past year. 2016 was a year in which several major tech trends truly took shape. Areas like virtual reality, self-driving cars, and artificial intelligence matured from seemingly distant concepts into tangible products that will eventually upend the ways people live and work. Amid all of this excitement, shares of artificial intelligence companies like Apple, Microsoft, and Facebook each outperformed the Nasdaq Composite benchmark in 2016. Not all AI stocks performed as swimmingly, though. 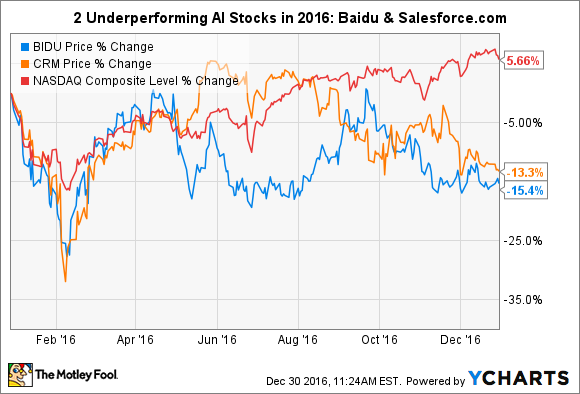 Names like Baidu (NASDAQ:BIDU) and Salesforce.com (NYSE:CRM) each handily underperformed the broad market indices last year. So, what drove the subpar performances at Baidu and Salesforce.com? And more importantly, what does this mean for each of these artificial intelligence stocks heading in 2017? 2016 has been an evolutionary year for Chinese search leader Baidu, one that should ultimately leave the company in a stronger position to grow profits over the long term. Baidu is in the midst of conforming to new, tougher standards for its search results that the Chinese government mandated earlier this year after the death of a Chinese student sparked a national uproar surrounding shady online advertising practices among pseudo-healthcare companies. This cleaning up of its results means Baidu has had to curtail or cut ties with some former advertising customers, which has crimped sales and profit growth in recent quarters. For example, Baidu's adjusted operating profit fell 12.5% year over year in its most recent quarter. However, making its search results more trustworthy should ultimately benefit Baidu, which remains far and away the most dominant search engine in China. Beyond the headwinds in its core business depressing results today, Baidu remains squarely focused on dominating the future of the Chinese technology market. The company has moved aggressively into the market for online services, including online restaurant delivery, maps, online video, online travel booking, and more. The company is also emerging as a leader in developing artificial intelligence software in China and is quickly developing real products and applications around this next wave of technology. Among the many examples are Baidu's AI-powered chatbots that help doctors more effectively diagnose diseases, software to help banks prevent fraud more effectively, and learning algorithms that enable self-driving cars to navigate streets more safely. Helping invent the future involves significant near-term investments from Baidu, and the exact payoff for such efforts isn't certain. However, between the long-term growth potential of its lucrative search business and the chance to dominate several important areas of the future of technology, Baidu's overall outlooks remains quite favorable indeed. Salesforce.com's appearance on this list likely has more to do with its heady valuation than any actual issues with its business, which has performed quite nicely over the course of 2016. The company has met or beaten analyst estimates in each of the past four quarters. Its sales are expected to grow more than 20% in its current year and next year. Moreover, Salesforce.com CFO Mark Hawkins has stated his goal of maintaining annual sales growth of at least 20% for years to come, though the overall market for customer relationship management (CRM) software is expected to grow 14% annually through 2020, according to Gartner. If it maintains its stated growth clip, Salesforce.com will hit CEO Marc Benioff's goal of doubling its revenue some time between 2021 and 2022. Though certainly commendable, there's a fair case to be made that Salesforce.com's stock has gotten ahead of even its CEO's ambitious goals. The company trades at a lofty 53 times next year's estimated earnings per share, more than double the S&P 500's lofty 25 times its current earnings. This can be the headache with investing in growth stocks. Though Salesforce.com helped pioneer cloud-based CRM software and has grown like a weed throughout its history, investor enthusiasm can push its shares to undue heights at times, which can lead to subsequent lulls in its stock price, as I believe 2016 represented for Salesforce.com shares.